Another unarmed black teen has been killed by police, this time in a predominantly black suburb of St. Louis, Missouri, which has a predominantly white police department. Racial tensions have run high for decades in this former railroad town that was once a mostly white St. Louis suburb until demographic changes sent many families packing for more distant communities. Today, Ferguson is predominantly black, but the law here is still enforced by an overwhelmingly white police force, a fact that helps engender widespread distrust of officers - never more so than last weekend, when a white officer shot and killed an unarmed young black man, Michael Brown, who was about to start college. Ferguson Police Chief Thomas Jackson said 50 of the city's 53 police officers are white. He said he made recruiting and promoting black officers a priority when he took over four years ago after a three-decade police career in St. Louis and St. Louis County. Jackson said he promoted two black officers to sergeant in his first year in Ferguson, though one of those officers has since left for a better-paying job. "I'm constantly trying to recruit African-Americans and other minorities," he said. "But it's an uphill battle. The minority makeup of this police department is not where I want it to be." The town of 21,000 has been on edge since Michael Brown, 18, and another teenager were confronted by an officer Saturday near Brown's apartment. Police say one of the teens shoved the officer back into his car and a struggle ensued. Brown was struck by several bullets after emerging from the car. 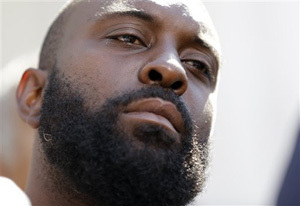 Eyewitnesses have said Brown was raising his hands in surrender and that the officer kept firing. Authorities had planned to release the officer's name Tuesday but decided not to because the officer has been the target of death threats. The FBI and St. Louis County police are conducting separate investigations. The shooting sparked two nights of unrest. Looting broke out late Sunday at dozens of stores in Ferguson and neighboring communities. On Monday night, police used tear gas and fired "bean bag" rounds after a crowd turned rowdy, throwing rocks and bottles at officers. No serious injuries were reported. Ferguson was once a middle-class suburban town known for its sprawling parks and tidy brick homes. For many years, it was largely white. Over the past few decades, the demographics changed. As St. Louis city schools deteriorated, a voluntary busing program started in the 1980s that allowed parents to send their children to suburban schools. Some black families decided to leave the city, and the crime, behind and moved to nearby suburbs like Ferguson. As more black residents moved in, whites in Ferguson began to move to outer suburbs. Ferguson is now about two-thirds black. The elected leadership of Ferguson - the mayor and four of the five aldermen - are also white. Mayor James Knowles III said he's having a hard time with the image of Ferguson as a racially divided, riot-torn place. "We're all broken-hearted, regardless of our race," Knowles said. "This is not representative of our community." Some of the town's young blacks feel unfairly targeted by police. Jarrett Snider, 19, said he was stopped while walking in his neighborhood. He showed his identification, but the officer still called for several backup units. "You get harassed," said Snider, who lives in the apartment complex near where Brown was shot and described himself as a good friend of Brown. "It's too much ... Mike's situation is not the first time." Stephen Bussey, 29, said he was recently stopped by an officer while walking to a convenience store before his pre-dawn shift at a fast-food restaurant. "The cop told me I looked like a guy who robbed a bank nearby," Bussey said. "I didn't make a big deal about it. But since when is walking a crime?" The mayor acknowledged the resentment. "The African-American community - youth in the African-American community in particular - has something against law enforcement in many ways," Knowles said. "They don't like law enforcement, and they don't think law enforcement likes them." Knowles said that suspicion is part of the reason the city has so few black officers. "We don't get nearly as many African-American applicants as we would like," he said. 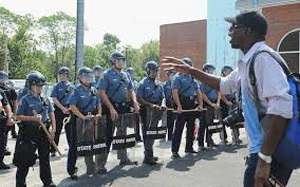 University of Missouri-St. Louis criminologist David Klinger said there are no reliable statistics on police-involved shootings in the St. Louis region, but he said police in the U.S. kill at least a few hundred suspects every year. Klinger, who has led two federally funded studies on police shootings and interviewed about 300 officers involved in those incidents, said police often show tremendous restraint, refraining from shooting suspects who come at them with knives or guns. Sometimes, he said, they simply have no choice but to fire. In other instances, mistakes are made. "Officers really aren't out there to shoot people," Klinger said. "That doesn't mean there aren't knucklehead cops out there. But the vast majority of officers have held their fire far more often than they've pulled the trigger." Associated Press writers Jim Suhr in St. Louis and Alan Scher Zagier in Ferguson contributed to this report.